The upcoming OZZFEST New Year's Eve celebration has expanded its headlining bill of some of the greatest names in rock to include a second (outdoor) stage. Concert-goers will now have 10 hours of entertainment before they ring in the New Year. 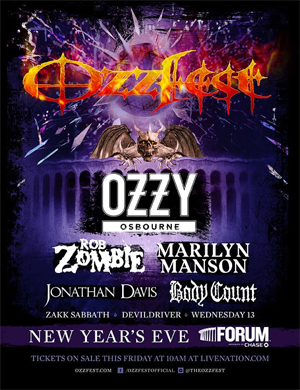 Set for Monday, December 31 at The Forum in Los Angeles, OZZFEST will kick off with live music at 2:30 PM with sets from ZAKK SABBATH, DEVILDRIVER and WEDNESDAY 13 on the outdoor stage. Early concert-goers will also get to sip cocktails while also enjoying offerings from a variety of food trucks which will be set-up throughout the outdoor performance area, all available for purchase. Food choices include Mess Hall Canteen, Burger Monster, The Viking Truck, The Coconut Truck, Kala Truck, Broken Rice and Drizzle Truck, plus a booth from the legendary Trejo's Tacos. At 6:00 PM, everything shifts indoors at The Forum where OZZFEST alumni ROB ZOMBIE, MARILYN MANSON, and JONATHAN DAVIS (of KORN) and BODY COUNT featuring Ice-T (in their OZZFEST debut) will take the stage. The night will conclude with a performance from festival namesake OZZY OSBOURNE, who will count down to the new year! Tickets for the Live Nation-produced OZZFEST 2018 are on sale now. Ticket prices range from $49.50 for general admission to $179.50 for a reserved seat.